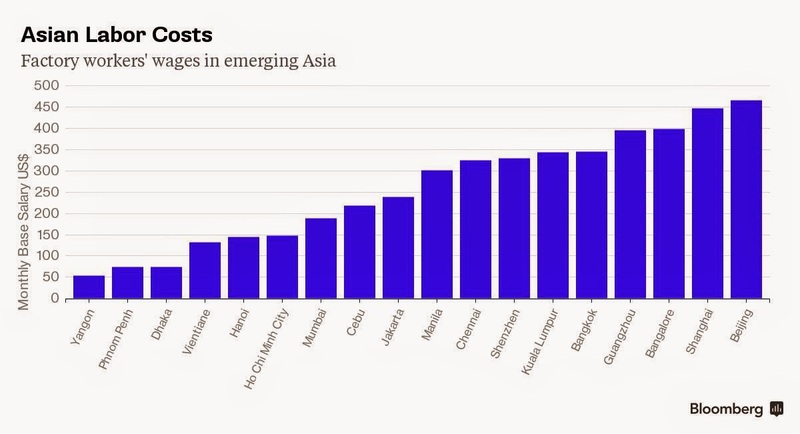 labor in Beijing, Shanghai, Guangzhu are twice than those in Cebu and Hanaoi; and 3-4x than those in Yangon and Pnom Penh. The article noted that "Manufacturers will be drawn to Southeast Asia's strengths, including the strategic location and cheap labor of Myanmar, Cambodia and Laos... By 2030, more than half of 650 million people in Southeast Asia will be under the age of 30, part of an emerging middle class with high rates of consumption...."
Another set of data, 2 1/2 years ago, from Arangkada Philippines. I think these numbers represent only the monetary pay. The various mandatory social contributions like SSS + PhilHealth + PagIBIG to PH government corporations, plus HMOs, plus mandatory leaves with pay like paid holidays, are not included yet. One problem with ever-rising mandatory and legislated minimum wage is that entrepreneurs have the option of hiring as few workers as possible, while giving high pay and various perks to those they have hired, to keep their productivity high, people who can do various tasks. Another option is to use more machines and robots. Here are two news reports, the first from FT, February 10, 2015, and the second is from The Telegraph UK, February 03, 2015. (1) FT: "Robots will replace a growing number of jobs in industries including automotive and electronics in the next few years, particularly in east Asia, according to new research. The prices of industrial robots have been falling steadily, dropping about 14 per cent in the past four years to $133,000 for a typical system, while capabilities have been expanding. Some robots are even cheaper: the Baxter robot from Rethink Robotics has a listed base price of $25,000, making it accessible to smaller companies that might have found it difficult to invest in earlier generations." Three of the uniformed actroids will serve as reception staff at the Henn-na Hotel, scheduled to open in July. Alongside them will be four service and porter robots, an industrial robot serving as a cloak room attendant and several robots whose primary task will be to clean." Related to Mary Jane Veloso's case in Indonesia, some people blast the PH government's "labor export policy". There is such a policy? I am not aware of that policy. If so, what law or RA, or Executive Order (EO) or Administrative Order (AO) is it? Employment is a private contract between the employer and employee, whether the employer is a foreigner or local; whether the employment will be abroad or here. Thus, the decision to work abroad, or study and live even temporarily abroad, is an individual and/or household decision. And if people decide to work abroad, it is important to obey the rules and regulations of the new destination country. We may disagree with their laws, religious and cultural practices, but we are guests there, we have to respect and obey their rules. Otherwise we should not entertain the idea of setting foot there in the first place. Then some people blast that "employment contract" because it perpetuates inequality in society between the workers and businessmen, employees and employers. Well if people do not want to become employees -- whether by Filipino or foreign employers -- they should employ themselves, become start up entrepreneurs and job creators. It need not be a big or medium size company, it can be a micro project like food stall, or an internet shop, or become free lance writer and consultant, etc. Well, if the $10,000 an hour CEO is able to expand the company, retain existing jobs with bonuses at year end, and hiring more, then his rate is justified. In contrast, another CEO gets $1,000 or $400 an hour, and the company goes bankrupt, the workers who get $8 or $10 an hour will soon get $0 an hour. The latter is not exactly a helpful model of a CEO for the rest of society. An entrepreneur who has empowered some people who used to earn nothing or $5 an hour somewhere and was hired at $8 an hour, will soon become a criminal, a law violator, if he does not give the mandatory, government-dictated minimum of $10 an hour or higher. Mentioning a CEO who earns $10,000 an hour is the trigger to justify and institutionalize a higher and ever-rising mandated minimum wage. We should respect individual decisions. Many in the haves take the me, me, me only perspective. But even some have-nots also exhibit the same attitude. The time they spend on political lobbying is 5x or 10x larger than the time they spend on getting real work or do micro-entrepreneurship. With political lobbying, via their votes during elections, they can get regular cash allowances, free healthcare, education, tractor, subsidized housing, etc. 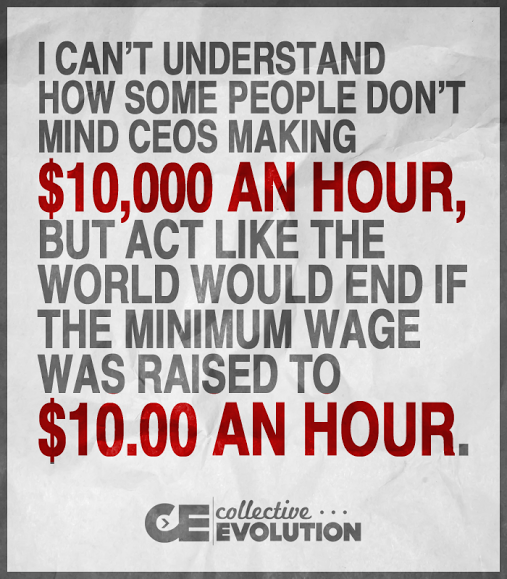 If a CEO earns $20,000 an hour and gives away to charity $15,000 an hour equivalent, is it still a problem? That Seattle CEO is cool. 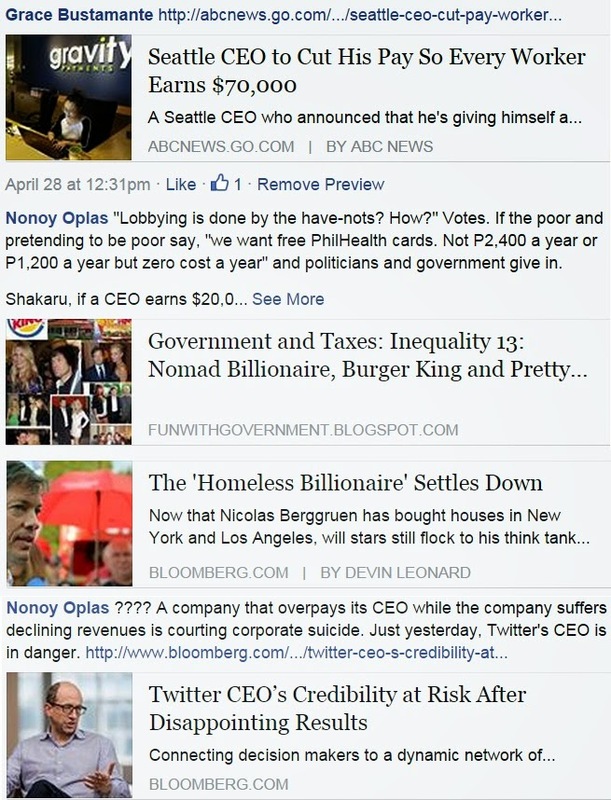 There are many CEOs who do more than him. Like the CEO of Burger King who has nearly $2 billion in wealth and income but owns no car, no house, no watch, and intends to give away at least half of his money someday to charity. About Manny Pacquiao's huge pay in his fight against Mayweather this Sunday despite only six months preparation, well, no one can become a Pacquiao within 6 months, or 12 months. Pacquiao reached his current throne after 15 or 20 years or more in the ring. Besides, if one will count the number of people working for him -- head coach, asst coaches, conditioning coach, sports physicians, asst trainers, masseurs, dieticians/cooks, bodyguards, etc. -- the number is big. And all of them are paid not by Bob Arum but by Pacquiao himself. 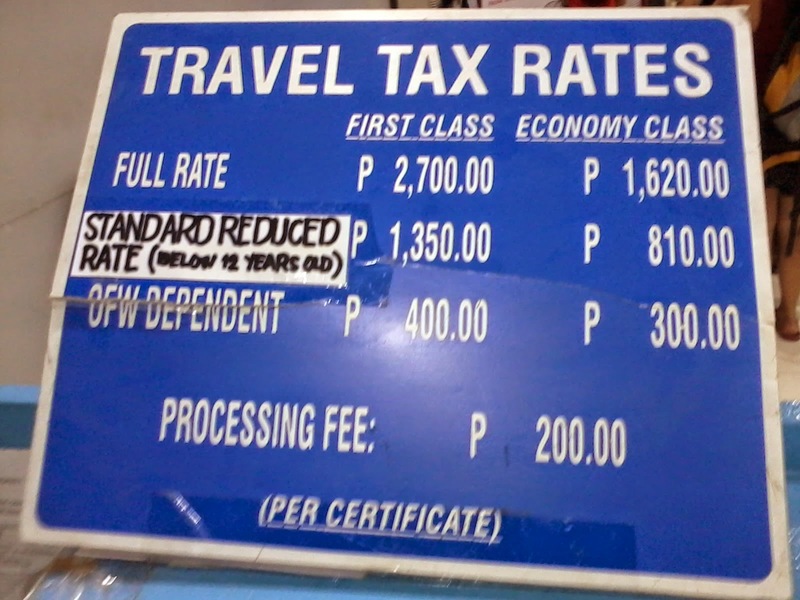 The Philippine travel tax is one of those envy-driven taxes. Just get the money by force, no need to explain where it is spent. This applies to Filipinos who travel abroad for pleasure/tourism, business, conference, etc. I took this photo last April 22 on my way to KL, Malaysia. OFWs are exempted from paying this tax, but they still have to get that certificate, meaning they still pay P200 to the government. If one pays the full amount of tax, no more processing fee. But if one avails of the reduced rates, say he brings a child who is below 12 years old, he pays the reduced rate + processing fee. Those who travel in business class also pay twice the rate for regular economy passengers. It is indeed an envy-driven taxation The government is saying, "you can afford to travel abroad for business or conference or tourism, you can afford to pay this tax." I said this before, I will say it again -- travel tax should be abolished. But sadly, all administrations from the 80s to the present have been enjoying this tax revenue. So cutting it would be against their personal interests and political career. 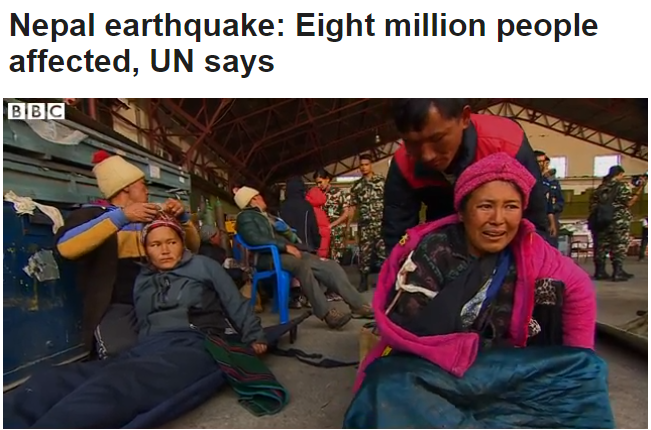 The strong earthquake that hit Nepal last Saturday has affected so many people. This BBC news today quotes a huge figure from the UN. When I was in Nepal last January, I took some photos of Kathmandu and Pokhara from the plane. These three shots were taken last January 12 afternoon, The plane was descending. Smog and smoke blurs the view of the mountains. There are very few buildings that are 10 storeys or higher. Dust and smog blurs the view of the city. Some roads are unpaved and hence, dust rise when vehicles pass by. The roads between rows of houses and structures are generally narrow, they are not visible from this elevation. The houses are generally bungalow type. I do not know how sturdy were the steel foundations that can protect the structure from strong ground movement. But very likely, their building quality is lower or weaker compared to big and tall buildings that are welded by strong steel bars, which are good protection against strong earthquakes. Below, some shots of a deforested hill in Pokhara, converted from forest to non-forest use, mainly for agriculture and human settlements. Steep hill sides are stabilized by rows of terraces. Columns of trees serve perhaps as boundary markers between and among private lands and farms. There are many houses in this hill. When there are strong earthquakes, they are prone to dangerous landslides. 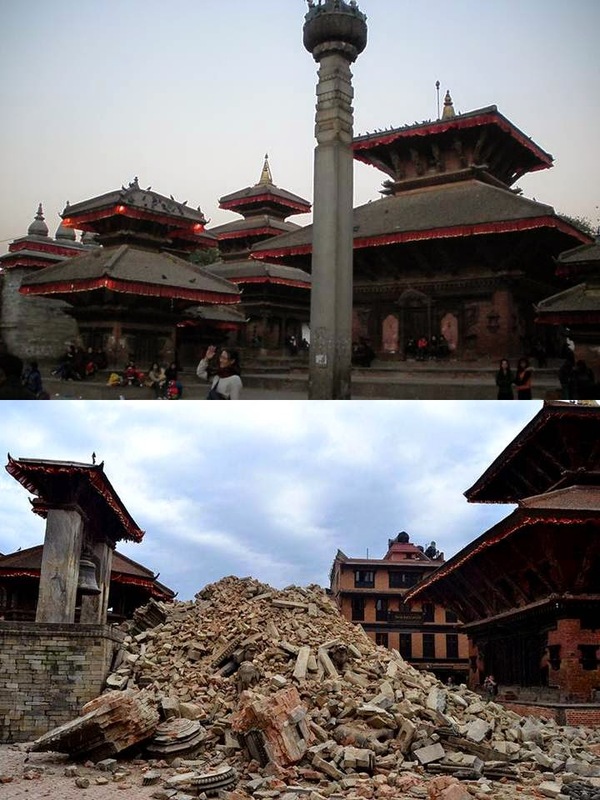 In Nepal, municipalities are the responsible agencies to issue building permits, but only three out of 58 municipalities have tried to incorporate the national building code into their permit process, Naresh Giri said in a 2013 report for PreventionWeb, an information portal for the disaster reduction community. Even these attempts have been “too limited and lack the necessary verification to ensure compliance,” Giri wrote. Land-use plans and building code requirements aren’t applied in the countryside and they’re not enforced in slums and other informal urban settlements, said Charlotte Benson, a senior disaster risk management specialist with the Asian Development Bank in Manila. From the WB's Doing Business annual reports, the procedures to get a construction permit in Nepal do not look too many. What pulled down its global rank is the huge amount of fees and taxes that the Nepal government, national and local, impose on its people. This earthquake should be a lesson for the Nepal government, to avoid high bureaucratism in giving construction permits. The people should use their money in buying more steel, more strong materials for their houses and buildings, not in paying more fees and taxes, and possibly bribes, to government officials in charge of granting the construction permits. Earthquakes (EQs) are part of nature. Along with volcanic activities, they can create new islands, sink old ones, raise an existing land or mountain, and so on. People and even geologists will never know when and where the next big EQs will happen. People can only prepare by having more sturdy houses and buildings and in the process, minimize damages and casualties. 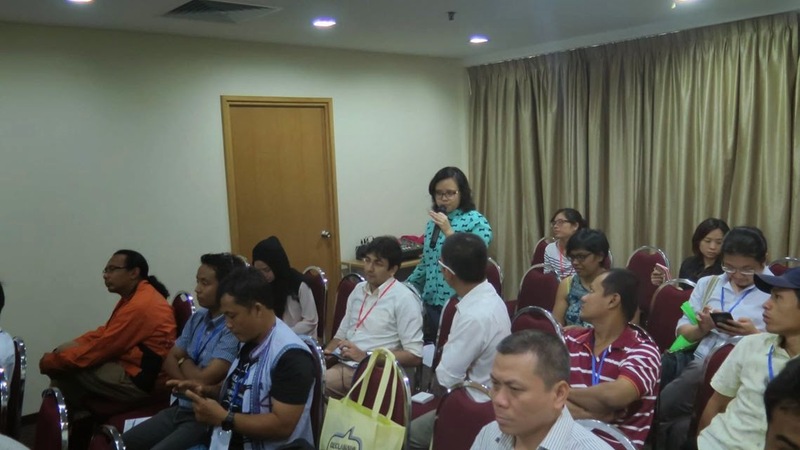 Last week, April 23, I was one of three speakers in a workshop on trade and investment liberalization in the ASEAN organized by the Institute for Democracy and Economic Affairs (IDEAS) and South East Asia Network for Development (SEANET), during the ASEAN People's Forum (APF) 2015, in Kuala Lumpur, Malaysia. 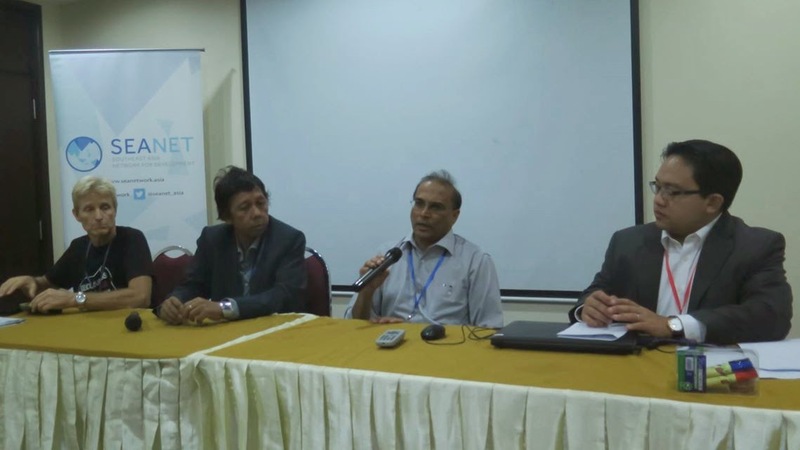 The two other speakers were Prof. Cris Lingle of the Universidad Francisco Marroquin (Guatemala) and Center for Civil Society (CCS, India), and Datuk Ravindran Palaniappan of Malaysia's Ministry of Trade and Industry (MITI). Photo below from left: Cris, me, Datuk Ravindran, and Wan Saiful Wan Jan, IDEAS CEO, who moderated the event. A speaker from Thailand failed to come. But Cris is an articulate speaker,also Datuk. 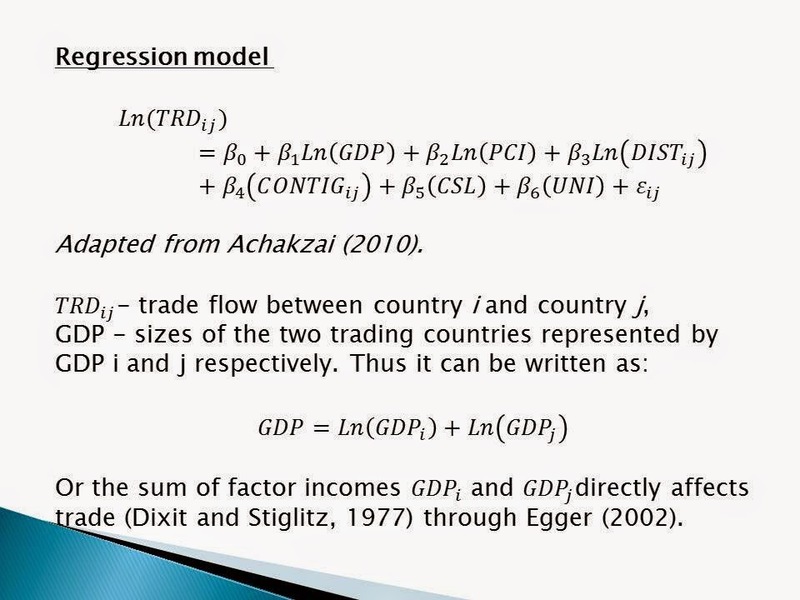 * “Going alone”, no need for reciprocity in reduction of tariff and other trade barriers (Richardson, 2001). 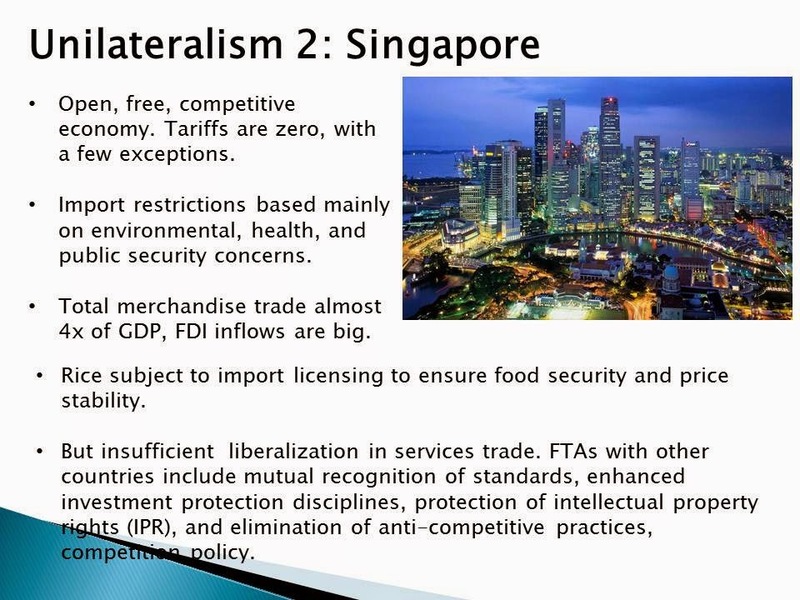 * Two types of unilateralism: (1) sectoral or few products, and (2) multi-products. Examples of (1) was the UK corn laws removal (1846); Ex. 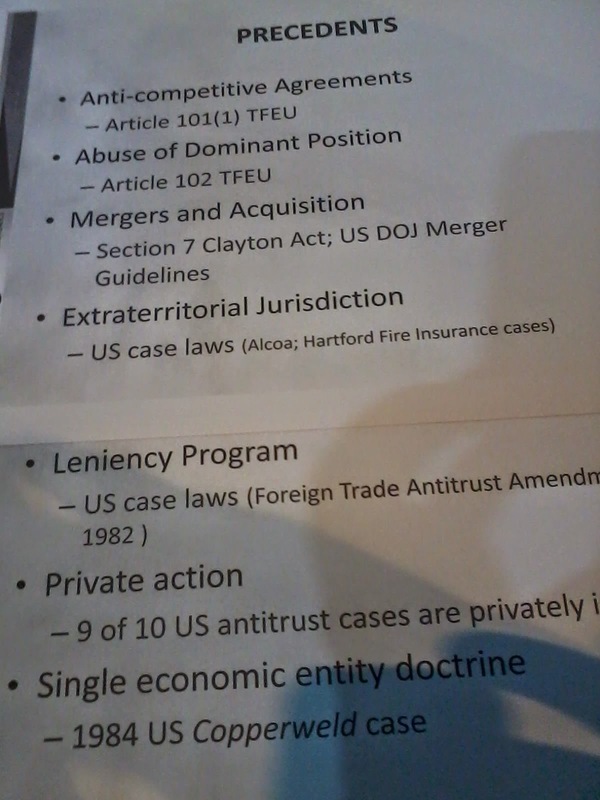 of (2) are APEC Individual Action Plans (IAPs). 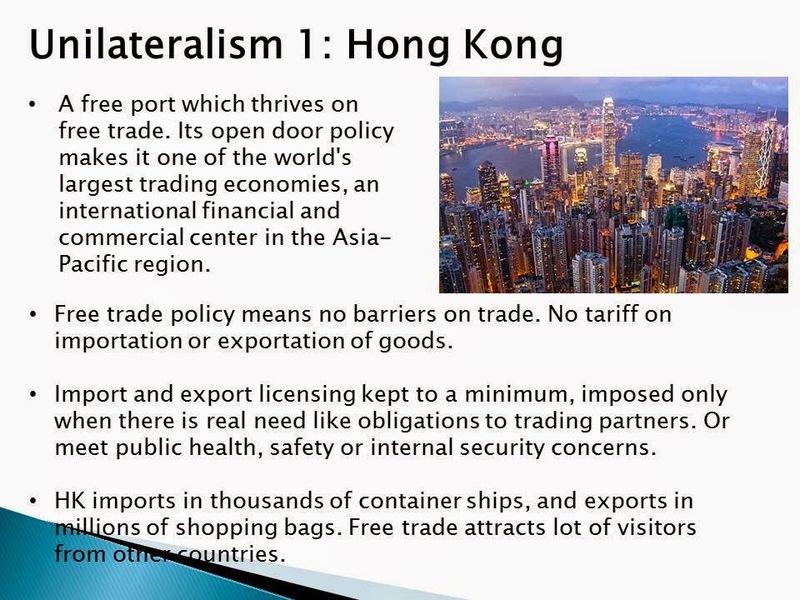 Then I showed these 5 cases of unilateralism, starting with HK, the perennial "freest economy in the planet" yearly by the Fraser Institute's Economic Freedom of the World (EFW) and Heritage Foundation's Economic Freedom Index (EFI). 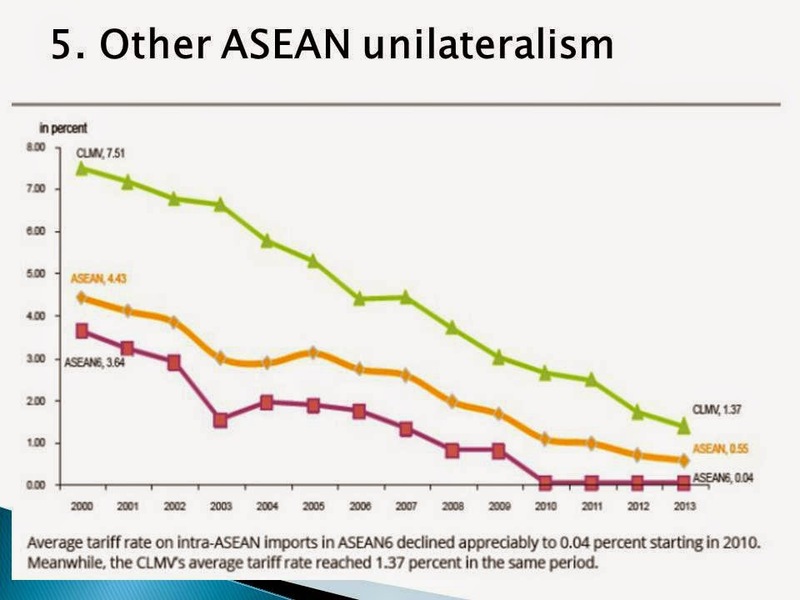 Our neighbor in the ASEAN also took this trade policy since about two decades ago and the results have been good. 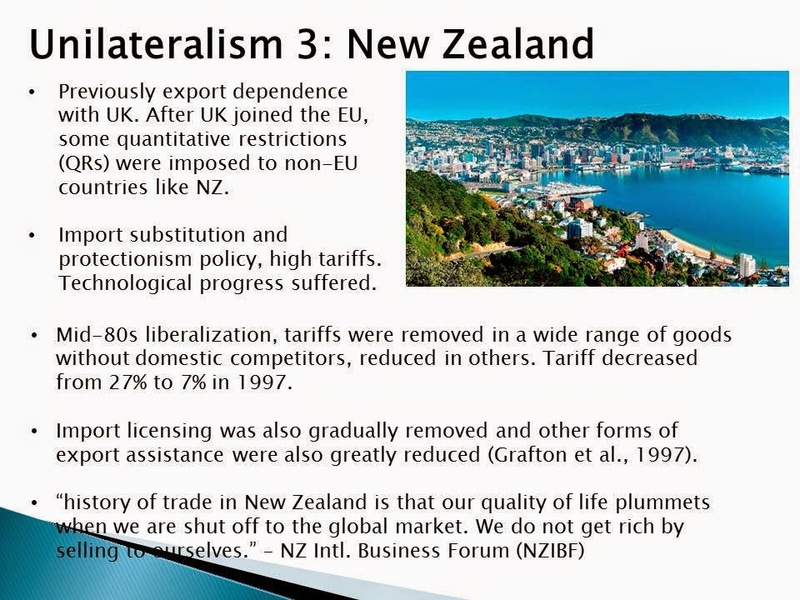 Then the cases of NZ and Chile. I wanted to discuss also the case of UAE and Dubai, but I lacked time to do more research that day. Below, light green line, CLMV means Cambodia, Laos, Myanmar, Vietnam. The red line is for the ASEAN 6, namely Brunei, Indonesia, Malaysia, Philippines, Singapore and Thailand. 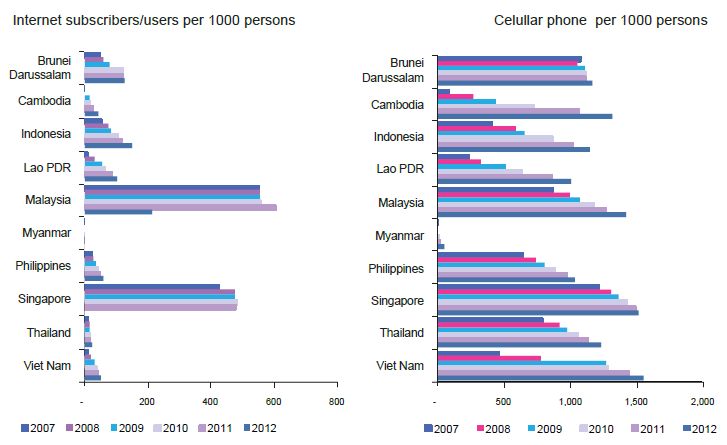 The middle, orange line is for the whole ASEAN 10 countries. Then I discussed the Gravity Model of Trade in analyzing and quantifying the contribution of unilateralism of four ASEAN countries, Indonesia, Malaysia, Philippines and Thailand, to their export performance and share of GDP. I will discuss and write it in another blog post. Four UPSE students, members of my undergrad organization then, UP ETC, prepared the econometric modelling and regression analysis. 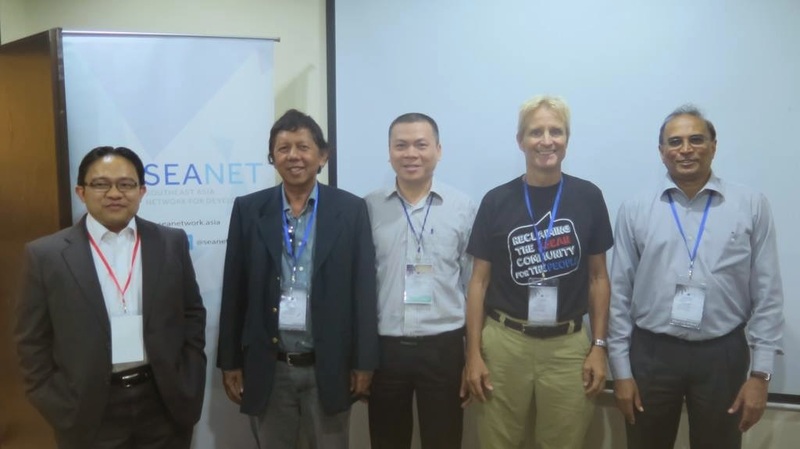 The open forum was fast and dynamic, as there were NGO leaders from Malaysia, PH, Vietnam, etc. 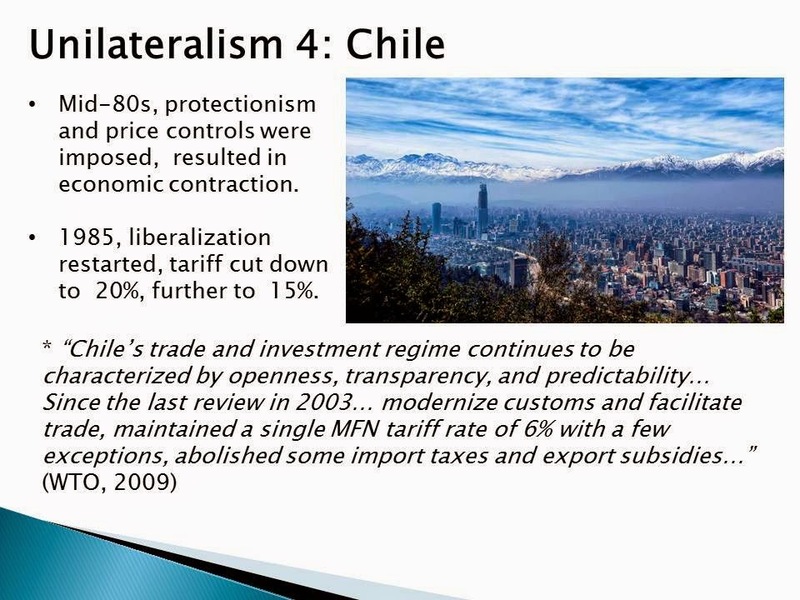 who are not comfortable with free trade, much more with unilateralism in trade liberalization. Cris and Datuk were great in answering the questions. Several points were raised by a participant from the Philippines, Dr. Nymia Pimentel Simbulan of PAHRA and PhilRights. She said that while economic liberalization may be good, the way it is implemented by many governments result in more poverty. Examples are (1) dumping of cheap agricultural products in the Philippines, resulting in the displacement of many Filipino farmers, Another is (2) mining where big foreign minilng companies that occupy huge tracts of land just destroy the land and rivers and they leave later with their huge profits. I answered that in concern #1, people generally change. So while the grandfather was a rice farmer, the father is also a rice farmer, the son should also be a rice farmer, and so on. One can move from rice farming become a vegetable farmer, chicken and poultry farmer, tilapia farmer, and so on, On #2, it is not true that big mining companies also mine huge areas of the country. I think their total mining concession areas could be no more than 0.01 percent of the country's total land area. Besides, if a company has a 2,000 hectares concession area, it does not mine all of it, normally they would mine only 50 or 100 hectares and when it's mined out, it is covered with new soil and reforested. Then start mining the next area. There was also a question from the audience about the impact of strict intellectual property rights (IPR) protection in pharmaceutical products under the proposed TPP Agreement where Malaysia will become a member; threats to AIDS and other patients Wan asked me to answer that question. I said that IPRs like patents apply only to newly-invented medicines. Though patent life is 20 years, the commercial period is only about 8-10 years as the first 10-12 years would be consumed by the various clinical trials (first with animals, then with moderately sick people, then with seriously ill patients, and so on, involving thousands of people from different countries) and regulatory approval processes. Besides, in the WHO Essential Medicines List (EML), I think about 99 percent of them are off-patent drugs and vaccines, meaning there are no IPR issues and these are useful, disease-killing medicines too, at lower prices. IPR in newly-invented medicines should be respected and protected, otherwise innovator companies will have little incentives to produce and invent new, more revolutionary medicines that can tackle new and evolving diseases. Above group photo from left: Wan, me, Minh Nguyen, Cris, Datuk. Minh is from Hanoi, Vietnam, and he is the editor of doimoi.org, a new think tank and translator-publisher of some important classical liberal books and papers into Vietnamese. Thanks again to IDEAS and SEANET for that great forum. Very sad to see the huge destruction in Kathmandu and other places in Nepal after the magnitude 7.8 earthquake yesterday. Reports as of this writing say that there were 2,500+ deaths and 60,000+ injured people. All of my Nepalese friends there were safe, but they were not exactly fine. Yesterday they could not go home and have to stay in open areas, in case a round of strong after shocks would shake the ground again. No electricity too, some could not post updates because their phone batteries were fully discharged. 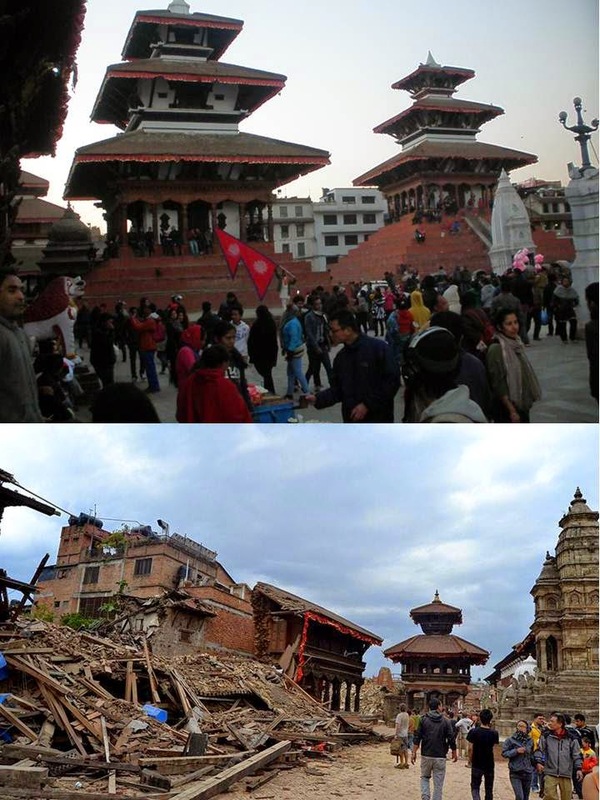 Here are some photos of Durbar Square, Kathmandu. Above, from my camera last January, lower photo from Bigyan Prajapati; not my friend but his photos were shared by some friends in fb. My good friend Charu Chadha of Media 9, which publishes Business 360 and World of Women (WOW) magazines, toured me for half day after I and Media 9 team came back from Pokhara. Below, same photo sources, respectively. 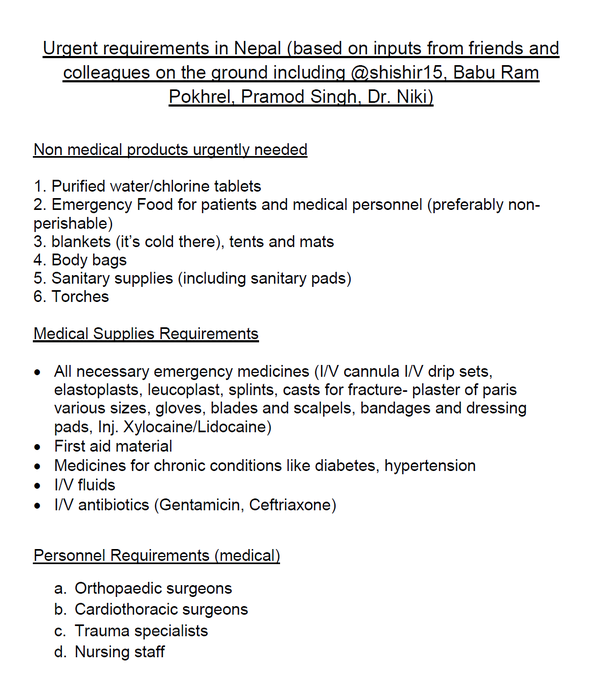 Some of the things needed urgently in Nepal, posted in twitter, #NepalQuakeRelief. I read once that earthquakes in Nepal may not be frequent, unlike in the PH, about 5 EQs a day on average, although majority of them are weak, felt only by seismograph machines, or happen under the sea. 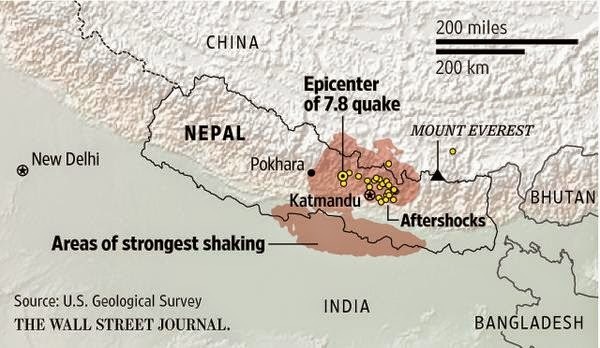 But Nepal EQs can be strong as the Indian sub-continent continues to collide or move deeper with the Asia mainland sub-continent. Thus, Mt. Everest and the other Himalayan mountains keep rising higher. There should be hundreds, even thousands, of donation drives ongoing worldwide by now. Many of them should be honest and reliable but a few could be bogus. If you wish to help, I can recommend one or three groups that are honest. 1. Media 9, Kathmandu, headed by its Editor, Charu Chadha. 2. Samriddhi The Prosperity Foundation, headed by Robin Sitoula. But I don't know if they are launching their own donation drives; will update if they do. 3. Krishna Neupane, a friend who used to head a small think tank, Limited Government Nepal, http://www.gofundme.com/sxmud5h9. Also my travel blog, previous articles about Kathmandu and Nepal in January and February 2015: Kathmandu to Pokhara by plane, Tribhuvan Airport, Durbar Square, Swayambhu Temple, Kathmandu from the Air. I arrived yesterday afternoon from Kuala Lumpur, after attending half-day of Day 1 (April 22) and half-day of Day 2 (April 23) where I was one of three speakers in a panel workshop on "Will Greater Economic Liberalisation Actually Help the Poor in ASEAN? ", sponsored by IDEAS, SEANET and ACSC/APF 2015. Have to skip the morning plenary of Day 2 because I was not feeling well and had to stay in my hotel room. 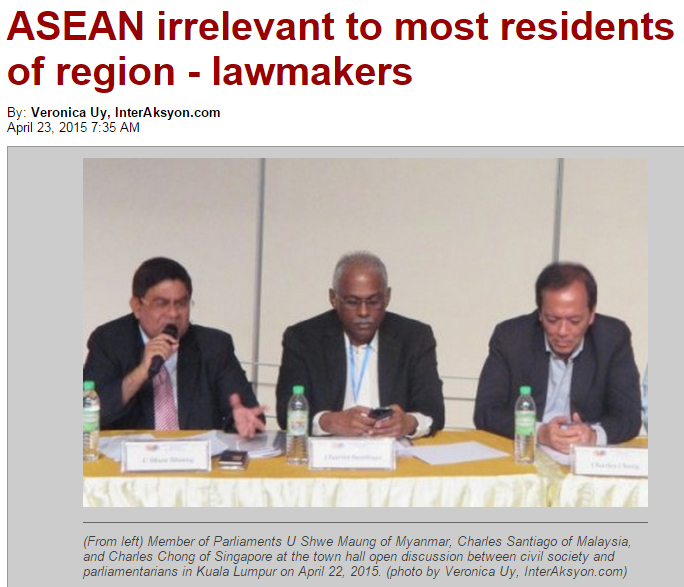 "Charles Santiago, opposition member of parliament of Malaysia, cited a survey of the ASEAN Secretariat in 2013 which found that three of four people in the region do not have a real understanding of ASEAN. Somehow those parliamentarians and legislators are correct. 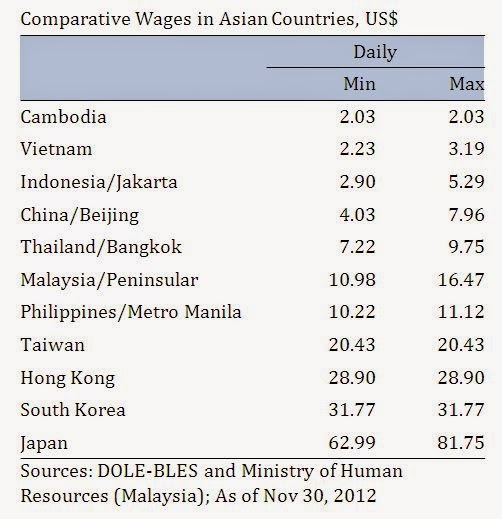 ASEAN, like the UN, OECD, WB, IMF, ADB, ILO, WHO, etc. are organizations or "clubs" of governments, and most ordinary people in any of their member-countries do not find any or all of them that relevant to their daily lives. But to imply that there were not much gains in the economic situation of the poor in the member-countries as a result of their membership in the ASEAN is wrong. 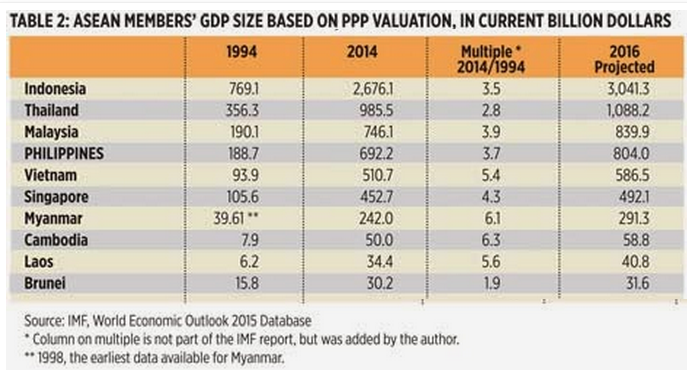 Take this data for instance, which shows how Cambodia, Laos, Myanmar, Vietnam (CLMV) were able to expand their economies by 5-6x in just a span of two decades, largely because they have liberalized their economies to their neighbors in the region, and to other countries. "Regional integration has potential for good, but it has to be fair and its benefits must be experienced by the people. A Social ASEAN is one where people matter where the fruits of integration are distributed among the people,” said Charles Santiago of MSN. 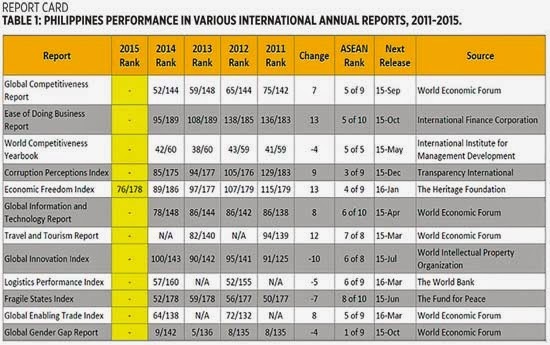 Santiago, who is also an opposition member of parliament from Malaysia and chairman of the ASEAN Parliamentarians for Human Rights, said the interests of the majority remain neglected in the ASEAN integration process...."
I think many of the NGO activist leaders in the APF did not see this chart from some ASEAN government officials' presentations. 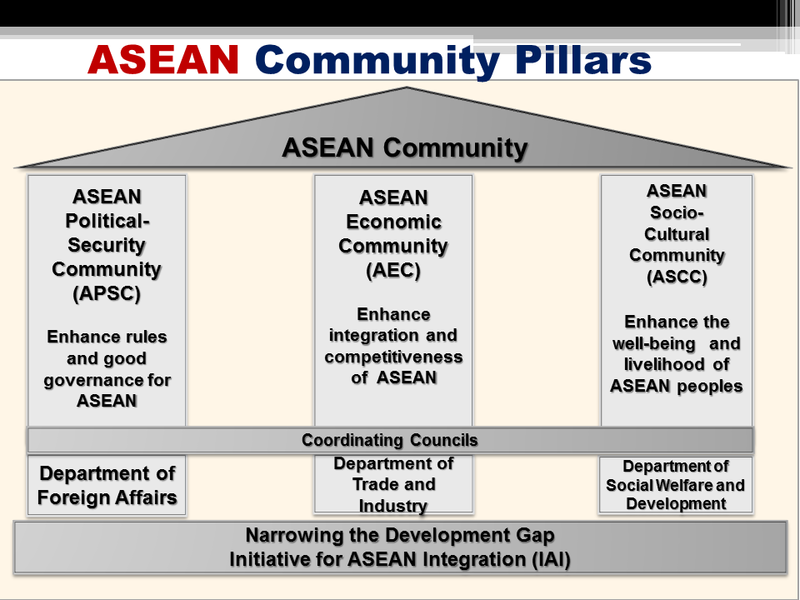 While the AEC is the central focus of the association, there are also ASEAN socio-cultural community and ASEAN political community. Ok, I am not exactly a great fan of the ASEAN and its member-governments. But the efforts of those governments to liberalize trade and investments among member economies should be recognized too. Many NGO leaders just specialize on negativism and insisting that only their version of what is "development" is the correct one. Many people are asking why there seems to be a disconnect between the Philippines’ dynamic economic performance on the one hand, and its unstable or messy politics on the other. There are two ways to tackle this question. One is to assume or accept that the statement is correct, that there is indeed a “disconnect” or “firewall” between the country’s economics and politics. The other way to tackle this question is to prove otherwise, that there is no disconnect between the two, that they are actually interlinked. Let us call them the “disconnect” and “connection” hypotheses. Among the proof given by the “disconnect” hypothesis are the following: (a) the Philippine stock market rising above 8,100, which is double the 4,000 in September 2010; (b) continued upgrades of the Philippines by the various international ratings agencies to stable grades and high growth projections, and of course, (c) high gross domestic product (GDP) growth performance, the highest in ASEAN and second highest after China in the whole of Asia if not around the world. Here is a list of positive developments in the Philippines as contained in a presentation by Foreign Affairs Assistant Secretary Luis T. Cruz at the Networking Forum on Post-2015 Integration on April 8, 2015. And yet, on the political front, proof of the “disconnect” are as follows: (a) declining public satisfaction with the President’s performance -- from a net satisfaction of 39% in December 2014 to only 11% in March 2015 -- as per the Social Weather Stations; (b) calls for the President’s resignation from various sectors after the Mamasapano incident; (c) dissatisfaction with government inefficiencies, such as the Bureau of Internal Revenue’s (BIR) anti-business rules, and the Land Transportation Office’s (LTO) “no plate no travel” policy despite its failure to provide the plates. The “connection” hypothesis recognizes all the above proof but it offers a different interpretation: people want economic optimism to be extended to political optimism. They want the bullish economy to have continuum in the government and political field. With a good, if not high economic performance, people expect good performance by the political leadership through more transparency and less red tape. More people want to put up businesses, and yet government agencies -- local and national -- put up many requirements, permits, taxes and mandatory contributions. More people buy new cars and motorcycles, but the LTO imposes a “no plate, no travel” policy with hefty fines even if it has a backlog in the issuance of license plates and stickers. More people buy smartphones and laptops, yet internet speed is slow and expensive compared to many of our East Asian neighbors. The International Monetary Fund (IMF) released its World Economic Outlook (WEO) 2015 Report last April 14. WEO’s online database is a useful source of information for various annual macroeconomic indicators dating back to 1980. Here are some data that can help contribute to the above discussion. 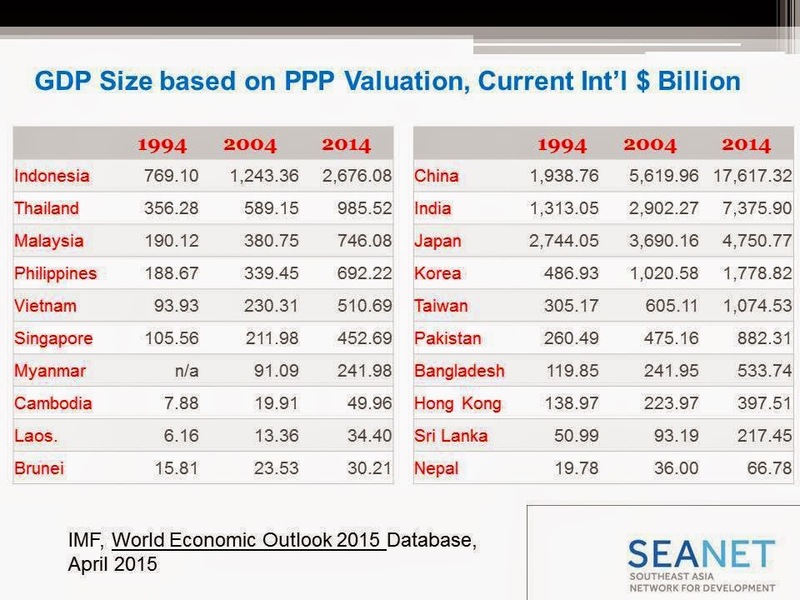 Purchasing Power Parity (PPP) is used in national accounting to remove high valuation in mostly rich countries of similar goods and services as those in other countries. Thus, GDP valuation is more or less equivalent. One, the Philippines’ economic expansion over the last two decades of 3.7 times was modest, compared with Indonesia, Malaysia and Singapore, but higher than those of Thailand and Brunei. Two, socialist or monarchy governments of Cambodia, Laos, Myanmar and Vietnam (CLMV), which began to liberalize their economies only about a decade or two ago, experienced fast expansion. Their low economic base in the 1990s partly explains this. Three, there is need to accelerate economic liberalization of the Philippines in trade (goods and services) and investments, allow foreign businessmen to invest with majority stakes in heavily protected if not pariah sectors like telecom, power generation and distribution, airlines and shipping, hospitals and healthcare, etc. The quick economic expansion of CLMV countries is a guide for the Philippines. 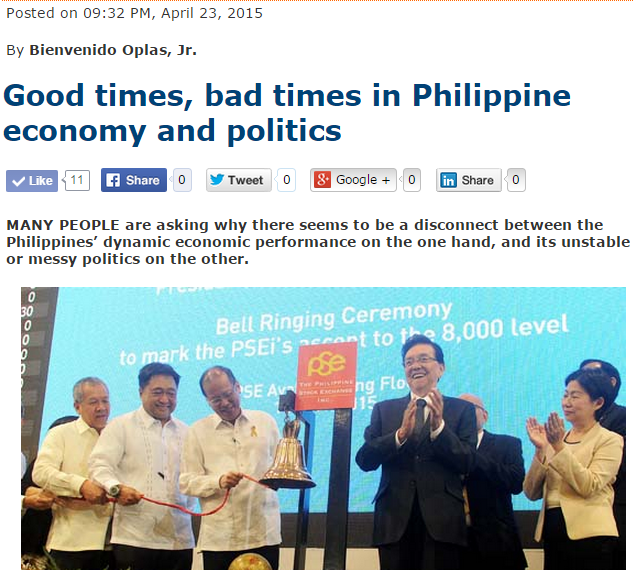 So, is this a case of “disconnect” or “connection” between Philippine economics and politics? It appears to be the latter. The people want their economic freedom to expand in the sphere of politics and government. Ramblings in the political sphere are expressions of this desire for more personal and enterprise freedom. The people want the government to give them more leeway, to have less bureaucracy, so they can reach out to more sectors and sub-sectors of the economy, and create more jobs. A graduate of development economics from the University of the Philippines School of Economics, Bienvenido “Nonoy” Oplas is president of Minimal Government Thinkers, a Philippine-based think tank that propagates free market economics. 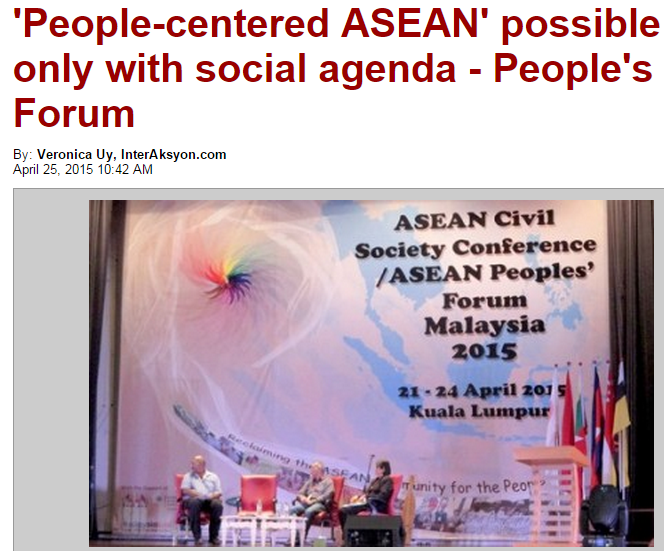 Tomorrow, the ASEAN People's Forum (APF) will start in Kuala Lumpur, Malaysia. 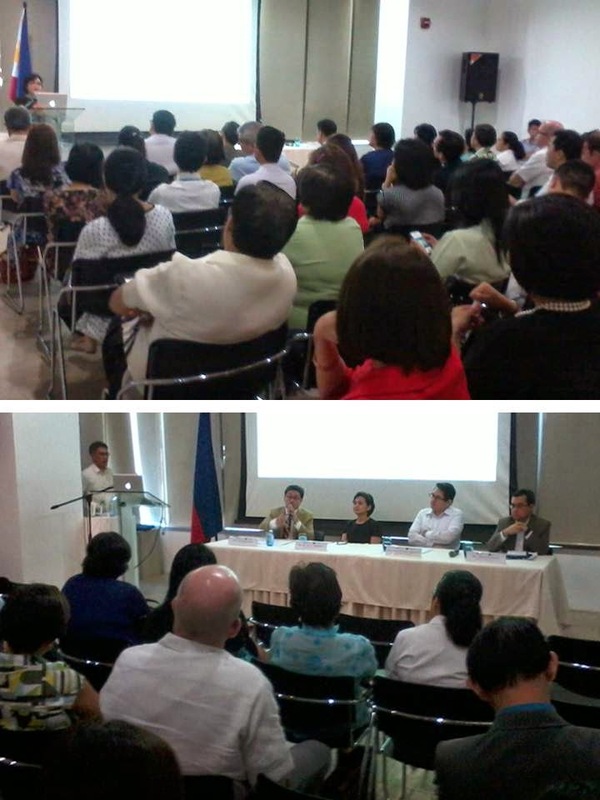 It is a gathering of largely anti-liberalization, anti-privatization and deregulation groups and NGOs. The 3-days event (April 22-24) is held before the annual ASEAN Summit will officially start, April 25-27, also in KL. The APF Secretariat is sending teasers to registered participants about selected panels by email. Here are four of those teasers. (1) On indigenous lands. This panel is an attack on state and corporations "collusion". The term "non-state" should actually and technically include not only private corporations but also NGOs, people's organizations (POs), church groups, rebel groups and other CSOs as they are all "non-government" entities. Land grabbing and stealing is a crime, and it does not matter if the land grabber is a local or foreign corporation or individuals, rich or poor. The main function of the state is to enforce the rule of law, especially the law against stealing and disrespect of private property rights, and the law against aggression against individuals. This concern can be tackled anytime anywhere and not an ASEAN-specific issue. 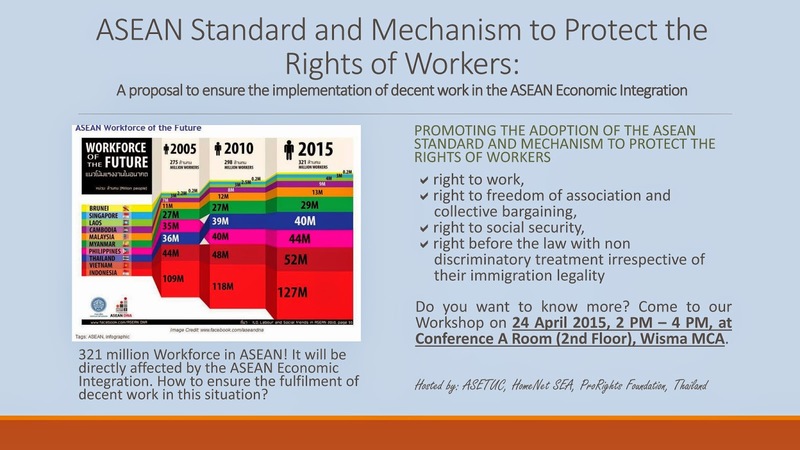 (2) Forum on "right to work" and "rights of workers". These are fine. But it seems that the advocacy has stopped there. What about the "right not to hire", "right to fire" of lazy or dishonest or inefficient job applicants and/or workers? What about the "rights of entrepreneurs"? Technically, "right to work" is an individual decision. There are many individuals who do not want to work even if a job opening is available to them; or do not want to stay to jobs they already hold. The same way, a "right to entrepreneurship" or "right to create jobs for others" is also an individual decision. Entrepreneurs can choose to hire only two workers instead of five or 10, and give those hired high pay, lots of gadgets and machines, training and seminars, to improve their productivity so they can do the work of 5 or 10 people. "The ASEAN Economic Community is likely to produce an escalation in cross-border investments within ASEAN, which brings with it significant human rights and environmental challenges. The workshop will examine recent transboundary human rights complaints to the Thai and Malaysian National Human Rights Institutions regarding cross-border investment by Thai and Malaysian companies in Laos, Cambodia and Myanmar. The discussion will highlight the role of national and regional human rights institutions in holding states and companies accountable for the results of their investments. It will also address the accountability and rule of law challenges that enable such human rights violations to occur and experience to date in investigating and remediating human rights complaints." I cannot attend this forum because I will be flying back to Manila morning of that day. But similar to my comments in #1 above, human rights (HR) is a fundamental issue as it affects the right to life, right to private property ownership of the people. It does not matter if the HR violator is a local or foreign company or individual. 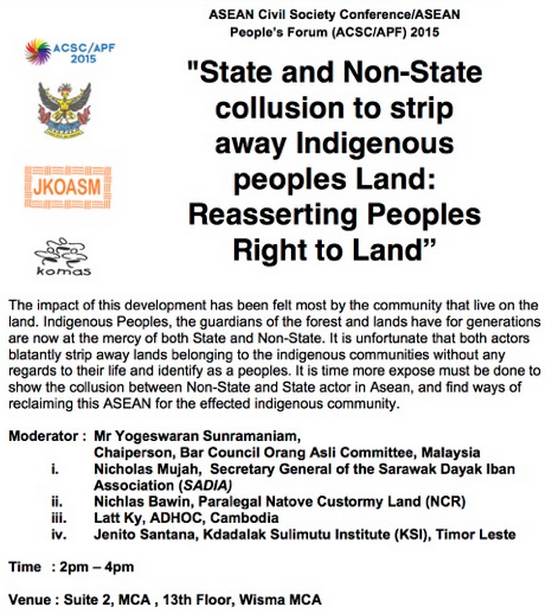 Now if the organizers and speakers of that panel would argue that AEC and intra-ASEAN investment liberalization is to blame, they are mistaken. With or without the AEC, or any other regional or multilateral economic agreements, the people's basic HRs should be promulgated and violators, local or foreign, government or private personnel, should be made accountable. The AEC is about greater economic integration of the 10 member-states of the association. It is both integration and competition at the same time, the same way that neighboring cities in the same country can be competing in attracting investors and visitors. And it is a good thing because it encourages, even forces people and officials, to become more efficient, more industrious and ambitious, more transparent and accountable, to their stakeholders and customers. It is unfortunate that a number of NGOs and CSOs fall for the populist belief that accelerated economic liberalization, greater economic integration and competition within the ASEAN, can be a bad thing. 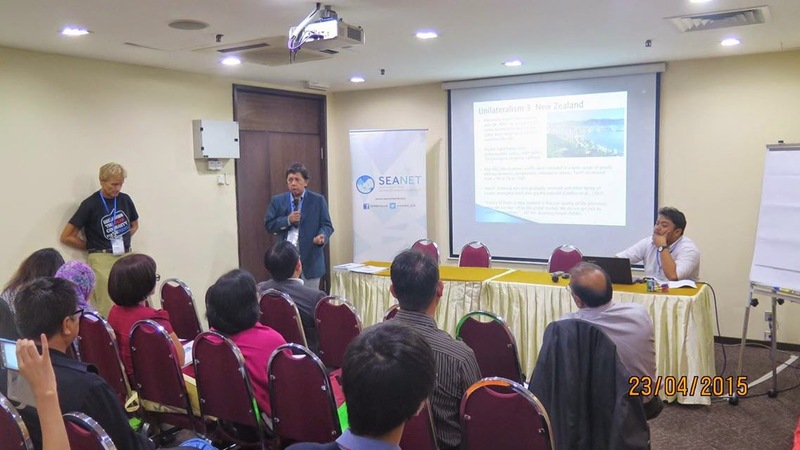 The new regional center and think tank South East Asia Network for Development (SEANET) would endeavor to help clarify these issues through more public education, citizens and civil society engagement. More choices and options, more freedom whom to buy from and sell to, ultimately redounds to economic empowerment and hence, poverty alleviation in the ASEAN countries and the rest of the world. 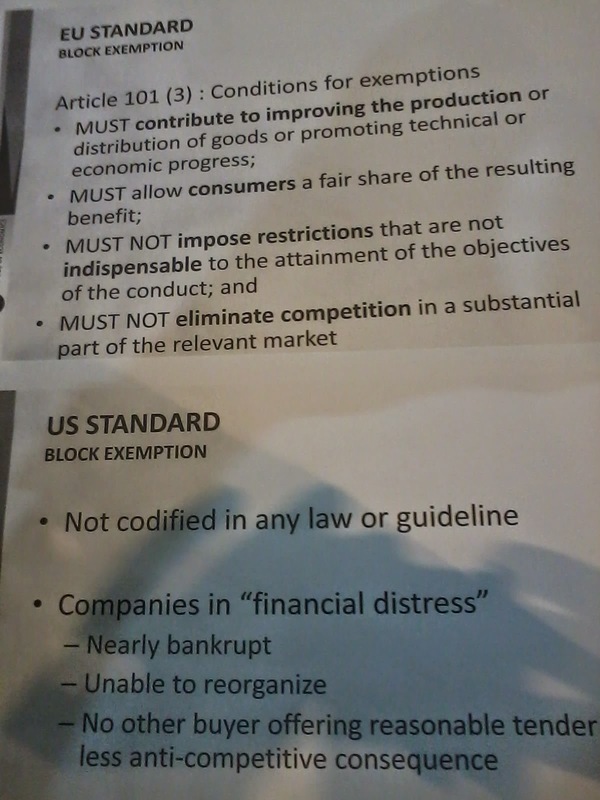 A Philippine Competition Law is coming soon, around July this year, according to Sen. Bam Aquino in a forum that I attended yesterday in Makati. 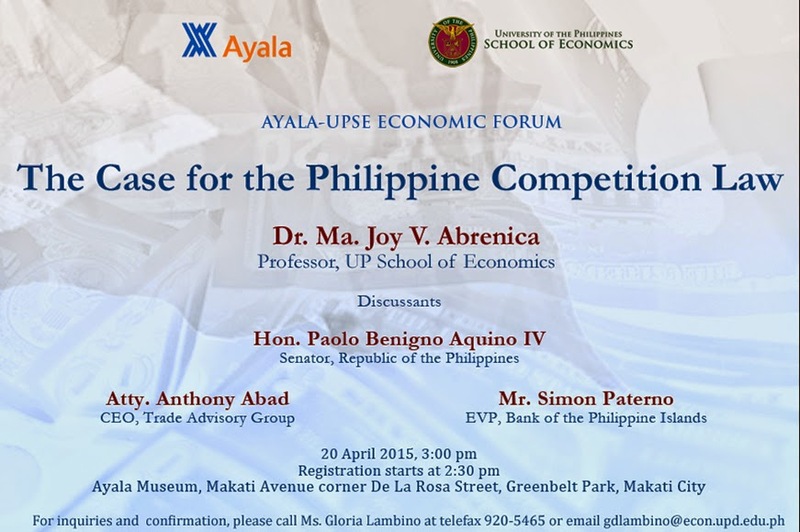 The main speaker was a friend and former teacher in Math Econ in PDE in the late 90s, Dr. Joy Abrenica. It was a well-attended forum. Mr. Jaime Zobel de Ayala was among the high corporate officials who attended the forum from beginning to end. Sen. Bam Aquino himself stayed all throughout too, even if he was not the main speaker. During the open forum, he discussed many things, like the degree of lobbying from different sectors in his office and that of other Senators. This is understandable as people express some apprehensions if their companies or sectors might be adversely affected by some provisions. He said that they expect the Competition bill to become a law before the President delivers his 6th and last State of the Nation Address (SONA) in late July 2015. Here are some of the slides discussed by Joy yesterday. I will just show them while discussing other points made by the other discussants. She went back to history (US, Europe, etc.) 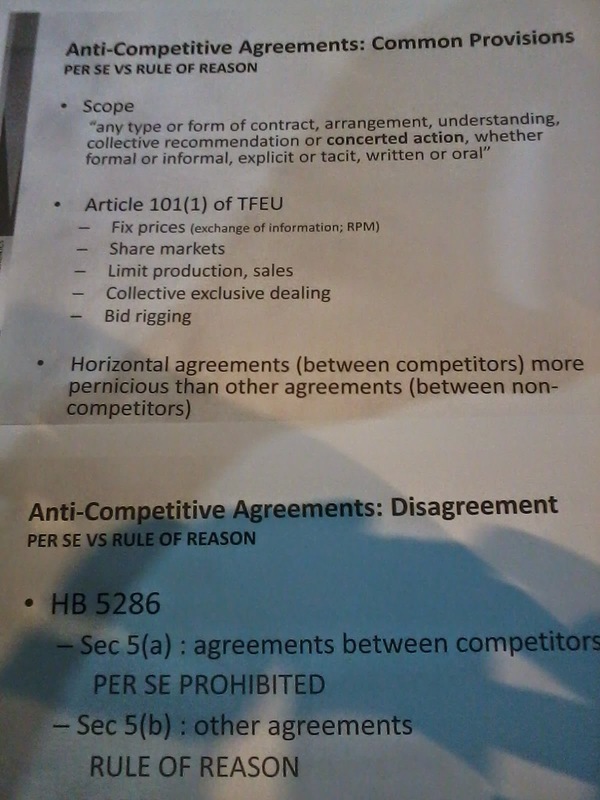 in analyzing the philosophy of competition legislation. 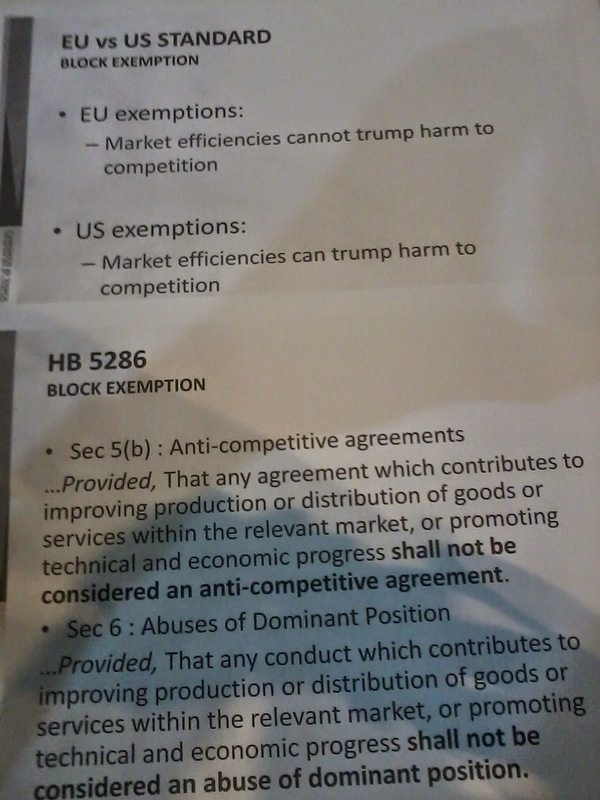 I have not read the Senate and House bills on competition policy, one reason why I attended that forum. And it was difficult for me to follow some of Joy's discussion precisely because I have not read the bills. Tony Abad, one of the three discussants and an expert on competition law of other countries and the congressional bills in the PH, emphasized that we need a competition law. Not only for the existing companies, local and foreign, but also because having that law is a requirement for the PH government if it wants to join some existing and emerging trade alliances like the US-led Trans Pacific Partnership (TPP). I can understand that those economic alliances would require such a law before applicant governments of other countries can be accepted because they want to see how their companies will be treated here in case they get into legal troubles on "anti-competition" charges someday. Simon Paterno said that government itself is a big monopoly. 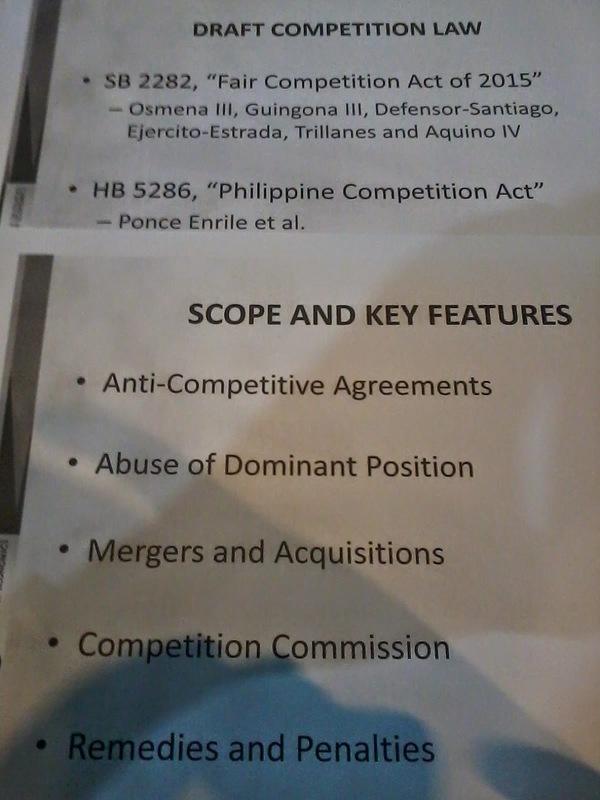 State corporations like the National Food Authority (NFA), rice importation certification monopolist; PAGCOR, casino and gaming certification monopolist and a player at the same time; Philippine Ports Authority (PPA) and Manila International Airport Authority (MIAA), monopolists in operating seaports and airports, respectively. That's a good point. And I will add that ALL monopolies and oligopolies are created by the government via various agencies, local and national. Tricycle route monopolies are created by the municipal and city governments. Jeepney route monopolies, sometimes bus route monopolies, are created by the Land Transport Franchising Regulatory Board (LTFRB), which is under the DOTC. Inter-island shipping route monopolies or duopolies are created by the Maritime Industry Authority (MARINA), local airline route monopolies or duopolies are created by the Civil Aeronautics Board (CAB). Electricity distributors and cooperatives, telecom companies, water utilities, cable TVs, etc. area or geographical monopolies are all created by Congress via legislative franchising. See, government is the creator of monopolies and oligopolies. So it is ironic that government is creating a new law supposedly to regulate anti-competition, monopolistic and oligopolistic practices. But then again, government is expected to produce this legislation, so we should have a new law on this soon as this has been filed in previous Congresses some two decades ago. Personally, I would wish to see a competition law where a new office or bureaucracy, the Competition Commission or Fair Trade Commission, will have power to clamp on other government agencies (LGUs, LTFRB, CAB, MARINA, PAGCOR, NFA, PPA, etc.) that disallow fair competition because they themselves are the monopolists, or choose special corporate interests as the government-blessed monopolists and duopolists. But those agencies will fight tooth and nail, horns and claws, to prevent that bill to become a law. And so we will have no competition law this year or the next 10 years or more. And the PH government will be embarrassed in the international community why it has no competition law until this decade or next decade. And that means we will have to accept this new law, imperfect of course, even "ugly" for some sectors. We can settle with that as a compromise, then work for its amendment in the coming years and decades. 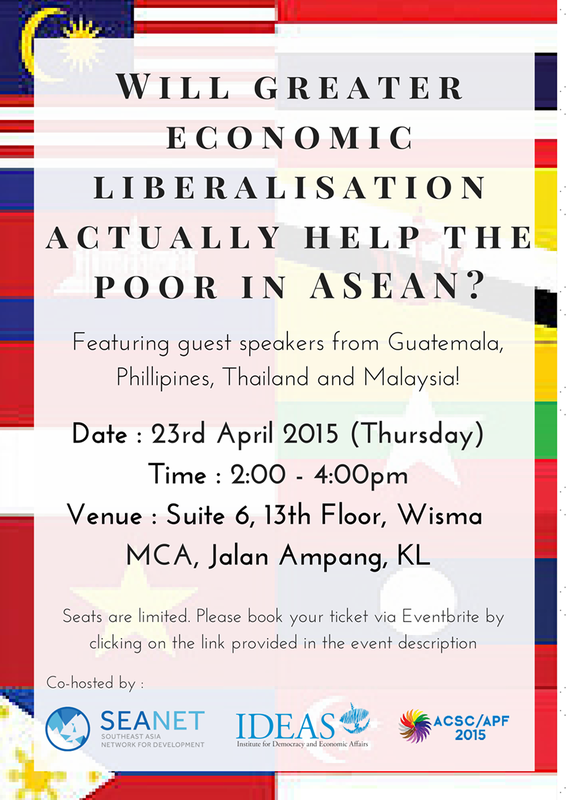 Next week, April 23, SEANET, IDEAS and APF/ACSC will jointly sponsor this forum in Kuala Lumpur. I will be there to attend and hear this forum as well as other panel discussions of APF/ACSC. If I am asked that question, my answer is a quick Yes. Why? Economic liberalisation (or liberalization) means giving the people more economic freedom to pursue various endeavors.. To produce various goods and services, to have more choices and options as consumers of final products (like food and shoes) or buyers of capital goods (like machines and trucks), raw materials and intermediate products that are used to improve their own production of various goods and services (like laboratory/diagnostic instruments for healthcare). 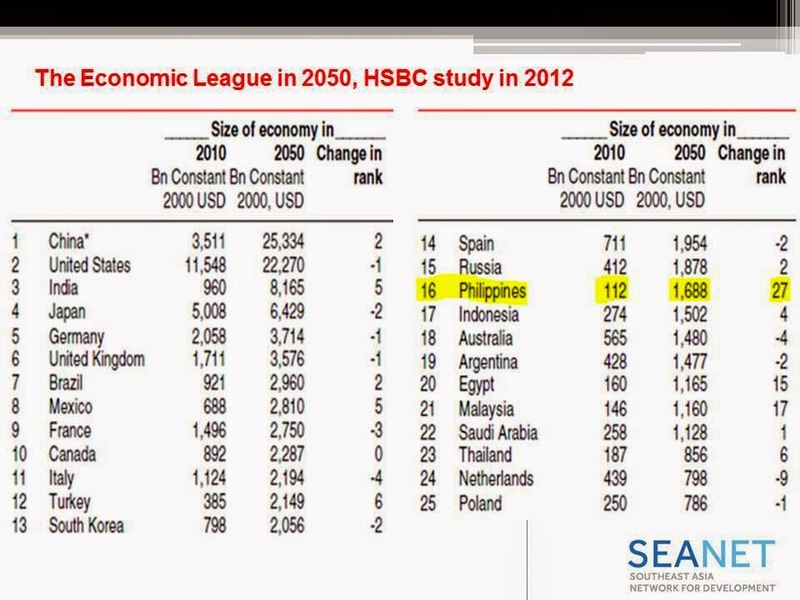 From a HSBC study in 2012, four ASEAN countries would be in the top 25 largest economies in the world by 2050 -- PH, IN, MY and TH. Economic liberalization in these 4 countries plus their rising and young population are the main factors for this good outlook. Trade and economic liberalization has been very beneficial to developing countries of Asia. Their GDP sizes have been doubling every decade on average. More liberalization means more access to more products from neighbors and other countries -- better products and/or cheaper prices. More laptops and computers, more mobile phones and tablets, more internet service providers, more telecom companies (except in some countries), competing for more subscribers. More liberalization means more choices, more freedom. Recently, this blog has attracted somehow high page views. From an average of about 370 pageviews a day from January to March 2015, from April 6 until today, the blog has been getting something like 700 pageviews a day. The biggest view was the other day, 2,300+ views. This screen shot was taken 6:15 am today in Manila. Below, traffic stats over the past 30 days including half day today. Most of the readers are from the US and Russia, The other day, there was huge traffic coming from Cote d'Voire, 1,600+ in one hour. I do not know what explains for that. 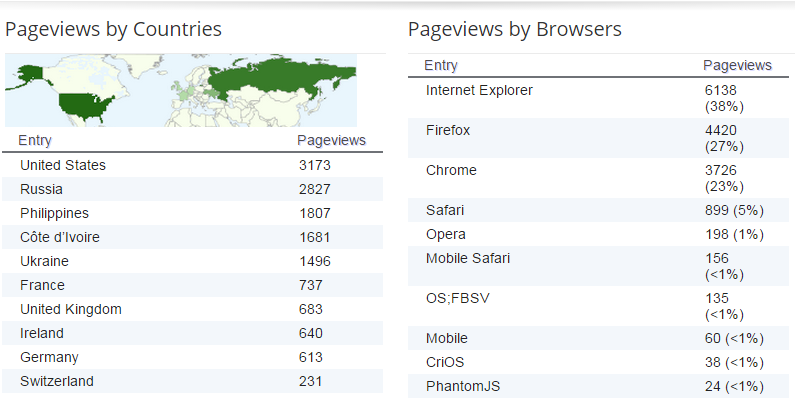 What is notable is that this blog is read more by Europeans than by Asians. Maybe they are mostly fellow Filipinos who are working or studying in Europe. To my readers, thank you. You see my bias of course, towards less government, more individual freedom, more personal and civil society responsibility, and more facts-based public policy advocacy. So long as the facts and hard data support this view, I will stay in this course. Thanks again. May I add that there are two mirror sites of this blog. there are http://funwithgovernment.blogspot.sg/ and http://funwithgovernment.blogspot.ca/. I don't know why blogger is doing these mirror sites, maybe for blog site protection. Anyway, thank you blogger.com.